I love fish … and although I call myself a vegetarian, I do eat fish on occasion so technically I’m a pescetarian. Next to Salmon, Tilapia is my favorite fish and I was anxious to make this spicy version of it from Blue Apron. One thing I like about having Blue Apron select my meals for me, based on my preferences, is that I’ll be forced to use ingredients I don’t normally buy myself … like these Castelvetrano Olives! Never heard of them before. I had to smash them with the handle of my knife and remove the pits. I have never cooked with olives. Can you believe it? It’s true! 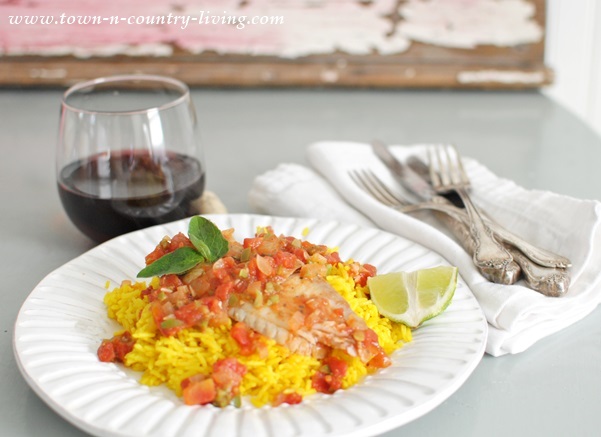 My hubby loves them … I’m not a huge fan but was willing to try them out in this tilapia recipe. This fresh beautiful garlic bulb was also in the box. I love garlic even though it’s smelly. We grow it in our garden. The olives and garlic are mixed with tomatoes, jalapeno pepper and tomatoes to make a spicy flavorful sauce for the fish. You serve it all atop of mound of basmati rice. I don’t drink white wine but have found you can serve red wine with fish. 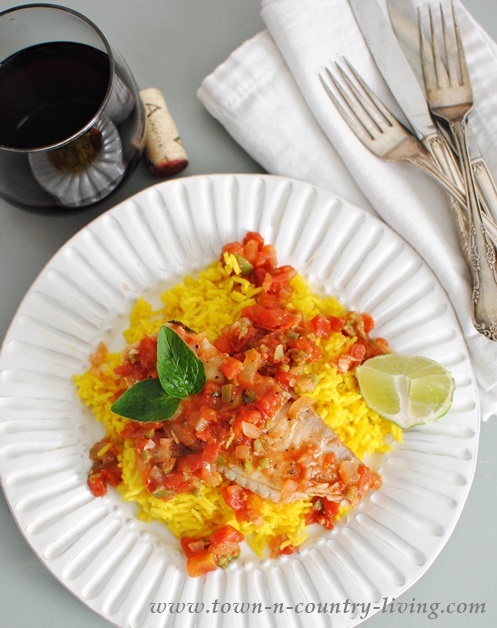 Simply choose a lighter red wine like a Rose or a lighter version of Pinot Noir, which is what I paired with this tilapia recipe. 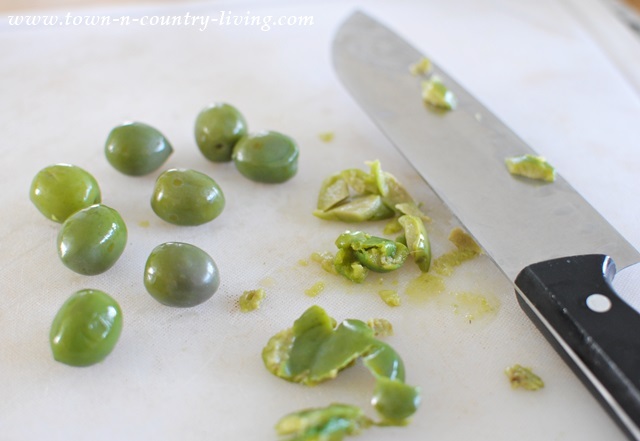 Grate the green portion of the lime rind to create 2 teaspoons lime zest. Quarter the lime and set aside. In small pot, heat 2 teaspoons olive oil on medium high. 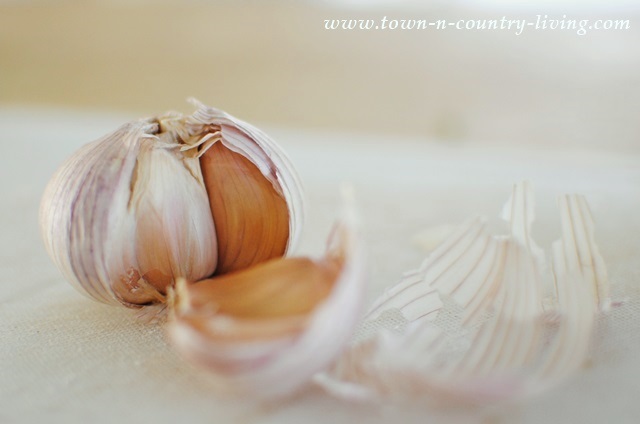 Add half of the onion and half of the garlic, and cook 3 to 4 minutes stirring frequently. Add the turmeric and cook 1 minute longer, combining well. Add the basmati rice, a generous pinch of salt, and 1 1/2 cups water. Increase heat and bring to boil. Once rice is boiling, reduce heat to low and cook 14-16 minutes, covered. Remove from heat and stir in juice of 2 lime wedges. Salt and pepper to taste. While rice is cooking, heat 2 teaspoons olive oil on medium until hot. Add jalapeno and the remaining onion and garlic. Cook 3-4 minutes stirring frequently. Add tomatoes, lime zest, cinnamon, bay leaf, and 1 cup water. Season with salt and pepper, mix thoroughly and cook 8-10 minutes, stirring occasionally. While sauce is cooking, season tilapia fillets with salt and pepper on both sides. In a large, nonstick pan, heat 2 teaspoons olive oil on medium-high until hot. Add the tilapia and cook 4-6 minutes on each side, or until slightly browned and cook through. Reduce heat to medium and add tomato sauce and all but a pinch of both the olives and oregano to the pan. Frequently spoon sauce over fish and cook 1-2 minutes. Remove from heat and discard the bay leaf. 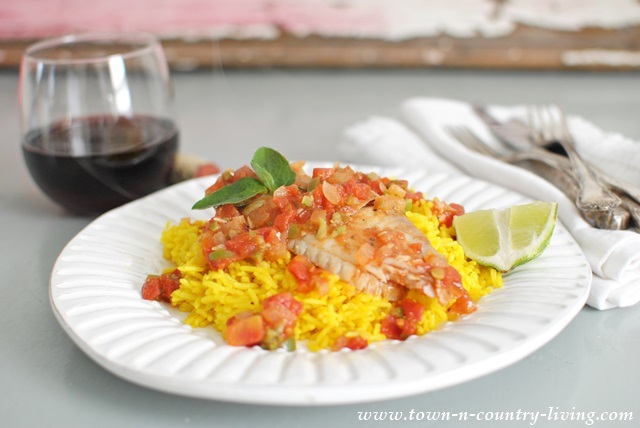 Place a mound of rice on each plate and top with the fish and tomato sauce. 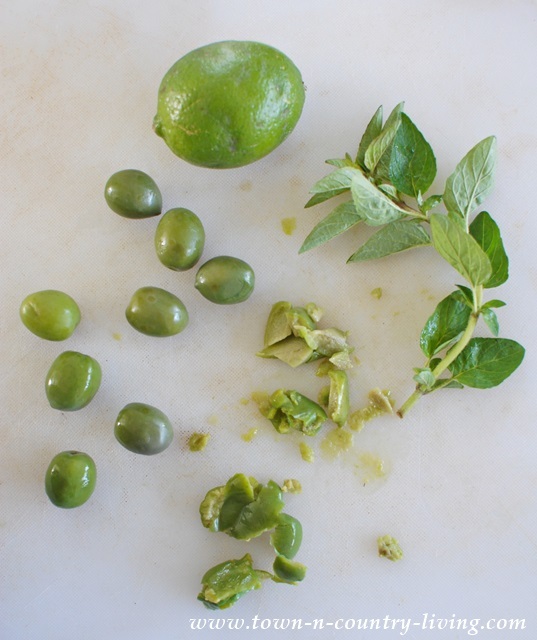 Use remaining olives, oregano and lime to garnish. I don’t like to meal plan or shop for groceries either so I am happy to hear about this service and look forward to seeing what other kinds of recipes/food they send you. This is pretty cool. I don’t try many new recipes if they call for “weird” (to me) ingredients. Feeding a family of 6, things are tight and I don’t like to take chances with my grocery money. I look forward to seeing what you think is worth buying as far as spices and such. I have never heard of this kind of service. I dream of NOT having to go to Walmart and Aldi’s every week. And then I hear the kids yell, Mom, we have nothing to eat, and when you are you going to the store … and I snap back to reality.